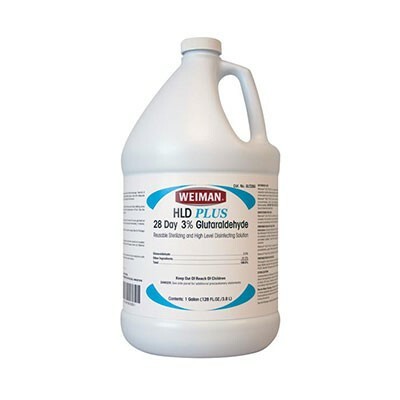 The Weiman Glutaraldehyde Glt28G provides high level disinfection or sterilization of heat sensitive, semi-critical surgical instruments providing the product is used according to directions for use and solution is above the 1.8% minimum effective concentration (MEC). Use test strips designated on bottle label to verify MEC. Weiman Healthcare Solutions is a market leader in the development and manufacturing of innovative products for surgical instrument cleaning, disinfection, sterilization and care. Weiman offers a full spectrum of the highest quality products for the surgical instrument and environmental cleaning, care and disinfection processes that are critical for infection protection in all types of healthcare facilities.